Frito-Lay is recalling a small number of 7 1/3-oz,. 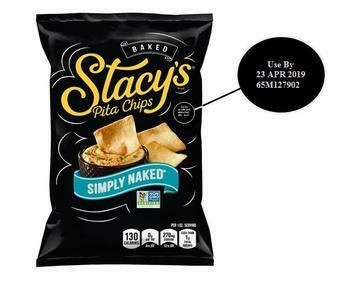 bags of Stacy’s Simply Naked Pita Chips. The recalled product with a “Use By” date of 23 APR 2019, a UPC code of “028400564632” and a nine-character manufacturing code of “65M127902” listed below the “Use By” date was distributed nationwide.